This is the first image of the Volvo S60 Concept, set to debut at the 2009 Detroit Auto Show. Volvo is calling the concept a preview of the 2010 Volvo S60. Volvo had better be careful or people will completely forget about the nameplate's stodgy past as the S60 concept is almost beautiful beyond belief. It takes on one of the final remaining traditional Volvo design elements, those normally straight, strong shoulder lines running font to back are reinterpreted in a curvaceous, smooth, sinewy line. The headlights are swept up and back and the roof line at the C-pillar is combined with the line of the trunk lid similar to what we've seen in the latest S40. Obviously the giant wheels and crystalline center stack mentioned won't make it to production and the suicide doors don't really jive with Volvo's safety mantra, but holy damn that's a beautiful car. A high-resolution image is available here and currently available details can be had below. FIRST IMAGE OF THE VOLVO S60 CONCEPT REVEALED Here is the first glimpse of the Volvo S60 Concept car which will be unveiled at the Detroit Motor Show in early January 2009, giving an indication of what the all-new Volvo S60 will look like when it's launched in 2010. "We both can, and dare, to deliver more exciting and more dynamic designs while maintaining our lead position in safety. The concept car shows part of our future, it's a hint that the all-new S60 will be one of the strongest contenders in the CD premium segment," says Stephen Odell, President and CEO at Volvo Cars. The first picture reveals the coupe-inspired silhouette that gave the original S60 its unique stance. It has now been further accentuated. "The concept car's design gives a visual promise of enthusiastic driving characteristics and I can assure you that the all-new S60 will deliver a sporty drive like no Volvo before," says Stephen Odell. New shoulders resembling a double wave The sleek coupe-like roof line is accompanied by entirely new shoulder contours, a gentle double wave from the headlamps at the front of the car to the tail lamps at the rear. "The inspiration comes from the Swedish coastline's cliffs and seas," explains Volvo Cars' design director, Steve Mattin. 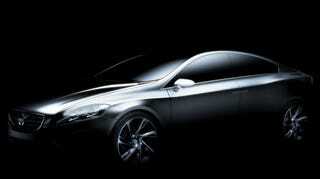 He adds: "The concept car's exterior gives a clear indication of what customers can expect of the all-new S60. On the inside we've been even more daring – there the focus has been on creating a vision of the future." Centre stack made of Orrefors crystal Among the interior features is a floating centre stack made of hand-crafted Orrefors crystal. It is shaped in a graceful, transparent wave from the instrument panel all the way to the rear seat backrest. The crystal panel appears to float above the centre stack's ergonomically designed functionality and it rests gently on rubber pads. "In a concept car the aim is to give your imagination a free rein and our iconic super-slim centre stack was the perfect object. Using pure crystal is a thrilling experiment. We may well see interior features in crystal-like materials in the future," says Steve Mattin.